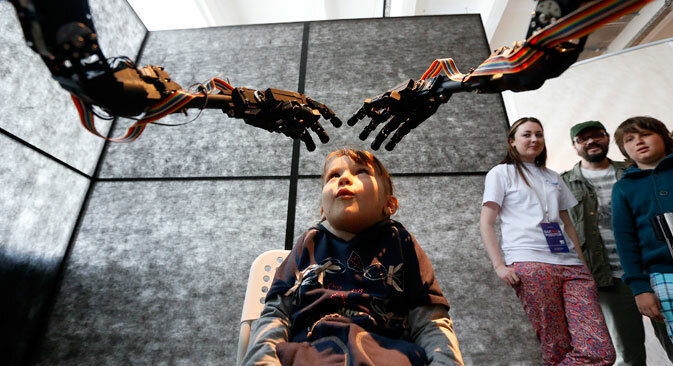 The "Robot Ball" scientific exhibition in Moscow, May 17, 2014. South Korea in first place; U.S. eighth on list. Russia was included on the list of the top 15 most innovative innovative economies in the world by Bloomberg. The leader of the "world of ideas" is South Korea, which tops the list with a total indicator of innovation index of 91.31 points, which were calculated based on an aggregate of indexes listed below. Second place went to Germany (85.54 points) and third to Sweden (85.21). Fourth place belongs to Japan (85.07) and the top five closes out with Switzerland (84.96). Bloomberg’s version of the innovative economy index consists of seven sub-indexes including R&D intensity, manufacturing capacity, productivity, efficiency, the concentration of researchers, the density of high-tech companies and the registration of patents. South Korea is a leader in several sub-indexes, which secured their leadership in the rankings this year. The top-10 also includes Singapore, Finland, the U.S., Denmark and France. Russia came in 12th place ranked between Israel (11th place) and Austria (13th place).